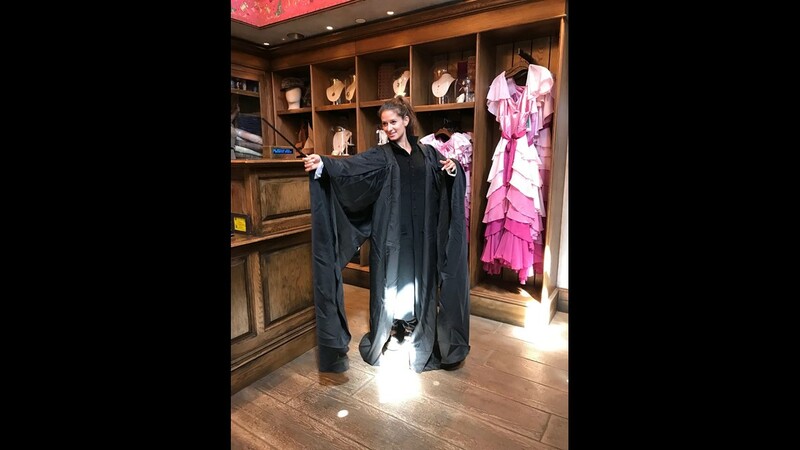 This high-end replica of Professor Severus Snape's robe (modeled by reporter Carly Mallenbaum) retails for $495 at Universal Studios Hollywood. 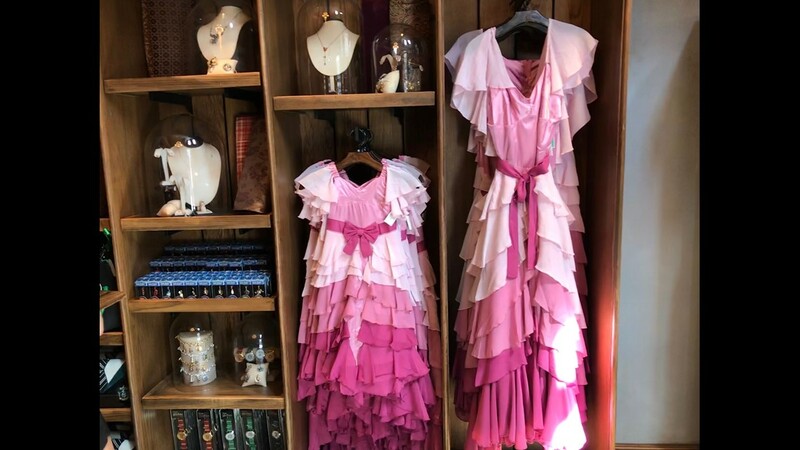 These dresses are meant to look like the one Hermoine wore at the Yule Ball. Kid's versions are $99.95 and adult sizes (which are new) go for $375. This replica Severus Snape rope is new and retails for $495. Just in: Clutches at the Wizarding World retail for $38.95. Butterbeer Ice Cream is new this summer. It will more than provide sugar rushes to overheated park guests. 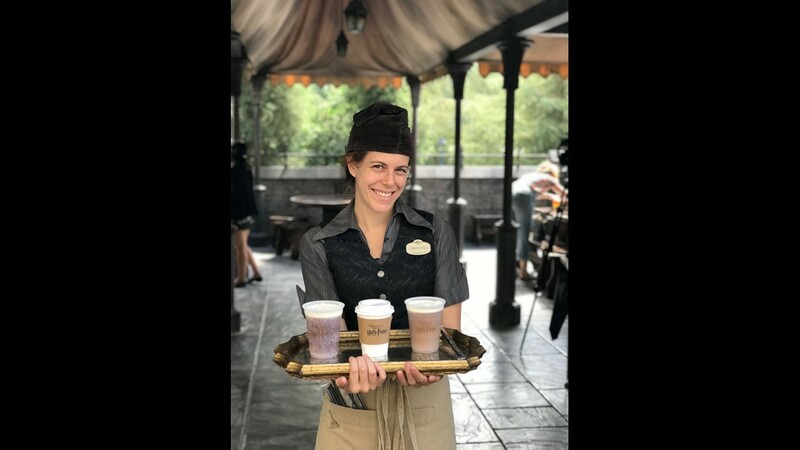 There are three different Butterbeer drinks: Frozen, Hot and original. Butterbeer Fudge tastes a lot like candy corn. 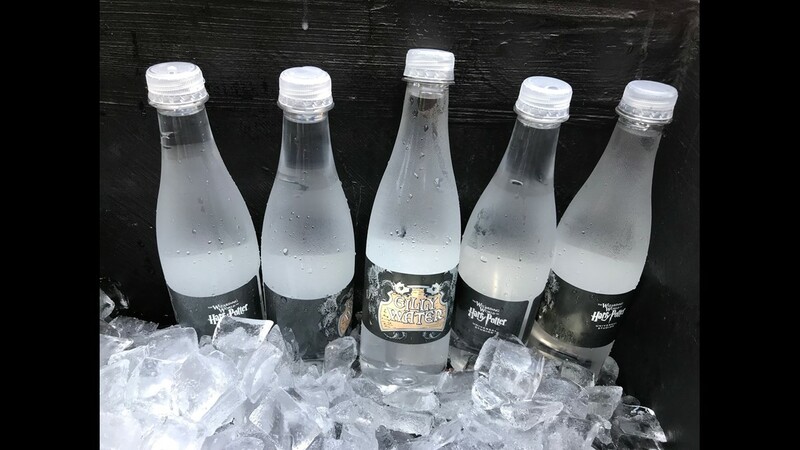 Here's the only low-calorie food item in The Wizarding World of Harry Potter: Gilly Water. Mere muggles may be afraid to brave an amusement park in this summer heat. But for wizards and witches ready to take on the lines and sun, Universal Studios Hollywood has a treat for you. 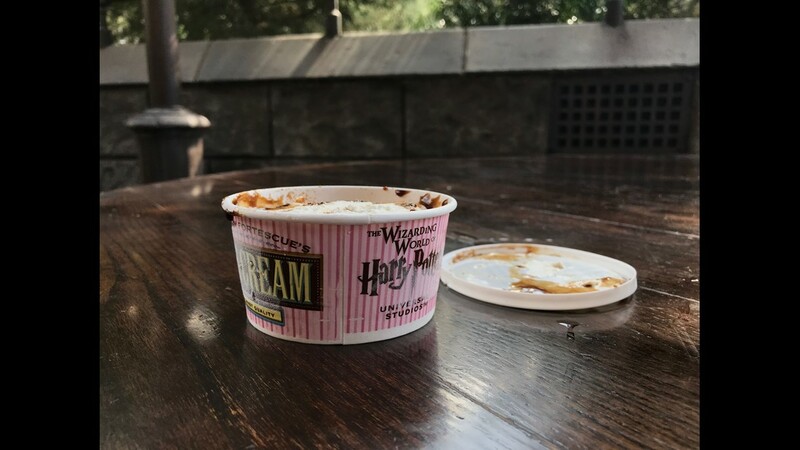 The newest addition to the park's Harry Potter-inspired collection of sugary drinks and foods is Butterbeer Ice Cream that goes for $5.99 a cup. 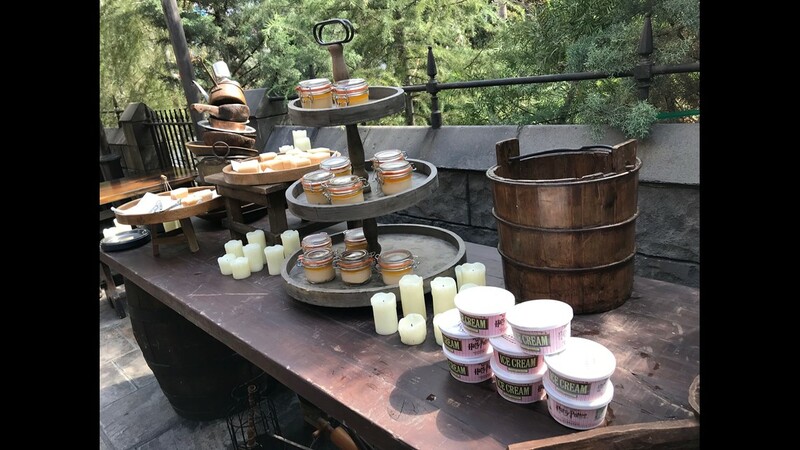 The dessert is being served at various carts within the Wizarding World of Harry Potter. (Orlando’s Wizarding World has a soft-serve option.) 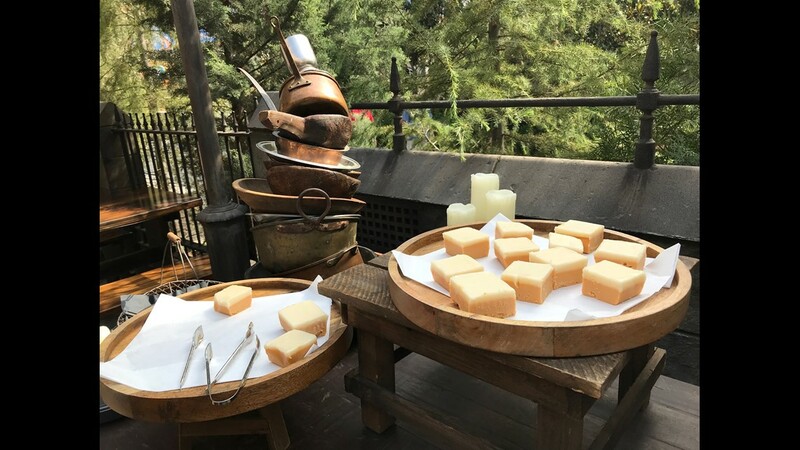 Universal hasn’t shared any nutritional information, but it tastes so creamy and butterscotchy that suffice it to say there’s enough sugar in one serving -- nay, in one bite -- to wake up tired adults and kids. A dark syrup adds even extra decadence to the already-sweet snack. Of course, other Butterbeer foods are still available for about $8 each. The original Butterbeer beverage tastes like a cream soda with extra cream. There’s the Frozen Butterbeer option, which is like a 7-Eleven Slurpee drink with foam (and my personal favorite); Hot Butterbeer that smells like a toasted marshmallow and tastes like a vanilla latte with couple extra shots of vanilla; Butterbeer fudge that you’ll like it if you like candy corn and Butterbeer Potted Cream which is basically a pudding version of the drink. And if shopping in themed, air-conditioned stores is your preferred way to spend your amusement park time and dollar, the Wizarding World also has plenty of fresh options for you. More highlights from the Wizarding World that are less expensive: Hogsmeade offers new jewelry with glasses and lightning bolts, from trendy designer Alex and Ani in prices ranging from about $30-60. 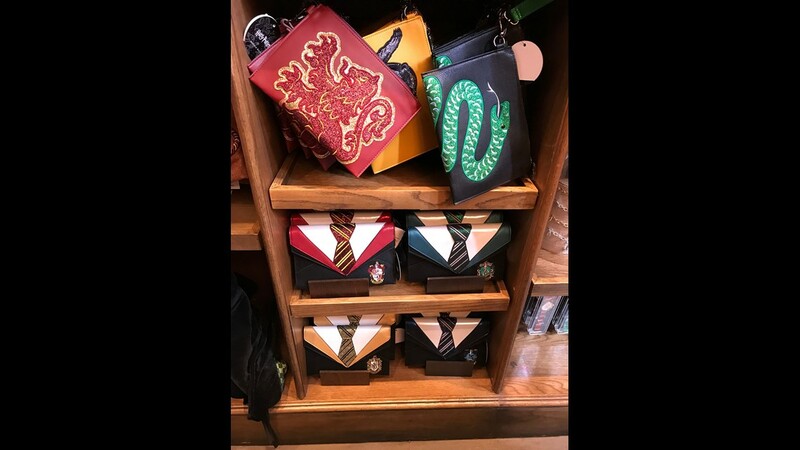 Hogwarts house clutch purses are also available for $38.95 each. In addition to the apparel and the food, this season Universal has added new fire-themed “spells” to the park, bringing the total of spots for wand usage to 15 (you're on your own for the $47 wand with a sensor, which is necessary for these particular spells). Once a year, however, Universal Orlando takes an even deeper dive into the world of wizards, wands, and Weasleys by presenting A Celebration of Harry Potter. A Celebration of Harry Potter is a special three-day event full of exciting experiences taking place January 27 to 29, 2017. This yearÕs event includes the largest Harry Potter Expo in event history and engaging panels and demonstrations featuring Harry Potter film talent and creative talent. HARRY POTTER characters, names and related indicia are © & ª Warner Bros. Entertainment Inc. Harry Potter Publishing Rights © JKR. (s17) © 2017 Universal Orlando Resort. All rights reserved. For the first time ever at Universal Orlando Resort, guests will be able to celebrate their Hogwarts house pride during an all-new, breathtaking experience – The Nighttime Lights at Hogwarts Castle – debuting on Wed., Jan. 31 and running select nights throughout 2018. As night falls in The Wizarding World of Harry Potter – Hogsmeade at Universal’s Islands of Adventure, state-of-the-art projection mapping, coupled with special effects and lighting, will wrap Hogwarts castle in a dazzling display celebrating the four houses of Hogwarts – Gryffindor, Ravenclaw, Hufflepuff and Slytherin.